I received a brand nephew just before Christmas so today’s card is the one I created for him. It is not the traditional soft blue as I’ve gone for a bright look. I didn’t mean to but I seem to be on a “Brights mission” of late. Have you noticed that with my cards? I saw this card on Pinterest, so took my inspiration from there. Thank you so much. For something a little extra special, I decided to create a Z Fold Card. The Base is Night of Navy. I then embossed a piece of Whisper White with the Happy Heart EF & adhered it to the left hand side. I then stamped the “wash splat” image from the “Sunshine Sayings” Stamp Set direct onto a piece of Whisper White in Daffodil Delight Ink. I cut a heart from Night of Navy using the Heart from the coordinating “Sunshine Wishes” Framelits which was adhered over the top of the stamped Daffodil Delight. I die cut a Baby T from Whisper White using the “Baby’s First” Framelits, stamped the little tie from the coordinating “Something for Baby” Stamp Set in Night of Navy Ink onto a scrap of Whisper White, die cut with using the little bow Framelit & adhered it to the Baby T. This was adhered over the Night of Navy Heart with Stampin’ Dimensionals. “Bundle of” from “Sunshine Sayings” Stamp Set was stamped direct onto the stamped card in Night of Navy Ink. “Love” from the coordinating “Sunshine Wishes” Framelits was die cut in Whisper White, Daffodil Delight & Night of Navy. I adhered the Night of Navy to the Whisper White & then the Daffodil Delight was adhered to the top but allowing a little bit of the Night of Navy showing to the sides. It was then adhered to the top of the Baby T. I did the Whisper White so that it would pop a little more. To complete my card, I randomly scattered Metallic Sequin Assortments around the card before layering onto a piece of Night of Navy & then to the Card Front. For my inside, I embossed a small piece of Whisper White with the Happy Heart EF, added a small edge of Daffodil Delight down 1 side & layered onto a piece of Whisper White before adhering inside. From all accounts, the mum loved the card & it has now gone into Leo’s Baby Album. I am sharing with you today one of the cards created for our “Pretty Pattern Papers” Tutorials which are launched the middle of each month. If you are not familiar with this, it is to try & get you to use your DSP lying around in your cupboard which you don’t really want to cut into, but know that you have so much of the stuff that you really have to start using it. I know, I was exactly the same & now, well I just love making that first cut into the Paper! The beauty of these Tutorials, is that the DSP does not have to be current, just as long as you are using your DSP is all that matters. Don’t forget to check out our “Pretty Pattern Papers” Page for more inspiration! Crikey, I can’t believe that today’s release will be our 5th. Where does the time go? Thank you to everyone who has been supporting us throughout our adventure/s. It is very much appreciated. Each month we release a set of 3 cards using DSP (Designer Series Paper), along with a Sketch, Supplies, Measurements & Instructions. It is a way to get you to use up that lovely stash of Paper you have sitting in your cupboard. The sketches are able to be used over & over so that you are creating entirely different looks. This month we are playing with the lovely DSP Stack – “A Little Foxy”. I love the colours in this stack & will admit that I didn’t want to cut into it, but now I can’t get enough of it. Throughout the month, I will be creating more cards using this lovely paper, so be sure to pop back to check them out. We hope you will join us this month. 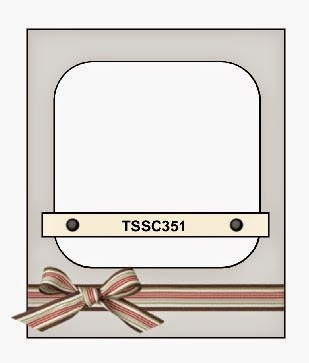 To purchase your Tutorial, please click on the Pretty Pattern Papers Page. As I liked the challenge over at Mary Jo’s, I decided to play along. Mind you, she always has a great challenge, it is just finding the time to play along. Once I saw the layout, I immediately wanted to use “By the Seaside“, but one of the designers had used it, so it gave me a good excuse to ink up a set that has been sitting on my shelf, but never used. Not only did it give me a good excuse to ink this set, but I have since checked that I am low on Baby Cards, so it worked out really well. I’m glad I did, as I am really happy with it. Since seeing this set, the pram reminds me of one of those old fashioned ones in the “good old days”. I think my brother & sister were wheeled around in one. After consulting my “Colour Coach” I went for Blushing Bride & Sahara Sand. I love these 2 colours together. To add a little bit of depth, I decided to use Perfect Plum for the greeting/sentiment. 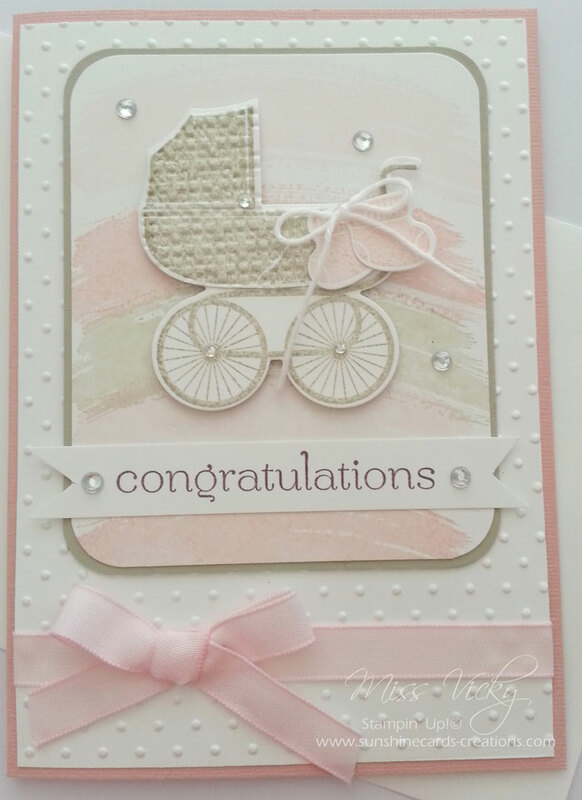 Once I had stamped, cut the pram & layered it onto the card, I decided that the background was a bit bland. As I didn’t want to emboss it, I decided to use one of the stamp sets that I think work great for backgrounds – “Work of Art“. Much happier! Mind you it was a toss up between this one & “Gorgeous Grunge”. I have used a couple of products that have retired, but you could change them out to current product. Why not head over to Techno Stamper to check out the Design Teams cards & also the other lovely cards created for the challenge. If you get a spare 5 minutes (boy, do I wish this had taken me 5 minutes) then play along. Thanks Mary Jo for a great challenge! If you click on the link below, you will be able to download the tutorial to create your own card.